TheBloomOutlet.com | Baby hamper can be a great option for you who want to sincerely congratulate new parents for their newborn baby. It is a perfect gift to give because a baby hamper can be packed with full of unique and different gift items to either the newborn baby and the mommy or both. You have to make sure that the stuff you buy are needed. Don’t buy the items they already have—too much. Instead, buy the items that the parents haven’t buy for themselves. If you really want to impress the receiver, you have to make give a fancy baby hamper Singapore. In this case, you can get it from a florist Singapore that will make sure you get the most impressive baby gift hamper. A hamper with the good quality and great design is simply what you need. Believe it or not, an impressive gift is something that can touch the heart of the receiver. To do this, you can add your personal touch on the gift to show them just how much you care and sincerely wishing for their happiness. You can add the baby’s name on the baby gift items such as a baby blanket, baby photo frame, or baby photo album. You can choose the items based on the parents’ preferences too when you know them well such as a package of baby gift items with their favorite cartoon character or in their favorite color. Lastly, you can add a lovely greeting card with your sincere message on the baby hamper Singapore. Toys are an appropriate choice for kids, after all. In the case for a newborn baby, you can give a package of fun and safe toys that appropriate with them such as soft rattles, toys with audio player or music to help them sleep, tethers, and many more. This is absolutely a useful gift you can give for a newborn baby. The baby will need a feeding set such as fork, bowl, or spoon to be used later when they grow up. The newborn hamper is not complete without a package of baby clothes, though. You can then fill the hamper with baby clothes such as baby booties, baby mittens, baby onesies, and more. So many cute designs of baby clothes that are available and make it fun to choose. The above suggestions are definitely the best choices you can make for your baby hamper Singapore even if there are actually still so many kinds of baby gift choices you can make. But what is important in here that your sincere intention to congratulate the happy family with the existence of a newborn baby. 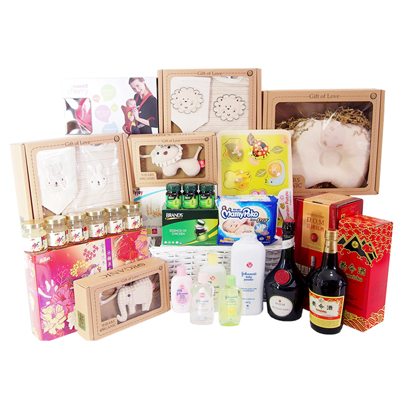 The act of giving baby hamper Singapore gift in a baby is just really an appropriate way to show your love and care.